NEW: Juliana D'Agostini & Emmanuele Baldini play Sonata Fantasia no1, from a June 2012 concert. Listen to the InstantEncore stream. NEW: From Tanglewood, a concert from July 27, 2012, with the BSO and pianist Nelson Freire, featuring Momoprecoce. Stream this concert on your desktop or mobile device. Lots more streams here! Here is a Portuguese recording of the Sexteto Mistico, from the faculty of the Conservatório de Música do Porto. Milos Karadaglic And The Power Of A Dusty Old Guitar, at NPR Music - a concert that includes the Villa-Lobos Prelude #1, the Etudes #11 and 12, and the Valse-Choro from the Suite Bresilienne. From Radio MEC, a podcast from the program Música e Músicos do Brasil with an interesting program that includes O Martírio dos Insetos, with violinist Flavio Augusto, harmonicist (is that the right word for someone who plays the "harmônica de boca"?) José Staneck and cellist Antonio del Claro. On Simone Leitão's website, streaming audio of Momoprecoce for Piano & Orchestra. From Radio Inconfidencia, the great tone poem Uirapuru, played by the Orquestra Filarmônica de Minas Gerais, from a November 2009 concert. Radio MEC posts podcasts of their A Música Clássica no Brasil program online. A recent episode, from February 27, 2011, features the great soprano Maria Lúcia Godoy singing Villa-Lobos songs, as well as Cantares de Minas. Pianist João Carlos Assis Brasil plays Villa-Lobos, Jobim, Bonfa, and Assis Brasil, in this MEC FM podcast of the January 15, 2011 program from the series A Grande Música. The program includes Impressões Seresteiras and the Luiz Gonzaga arrangement of The Little Train. The next edition of the Música e Músicos do Brasil podcast will feature the pianist Lúcia Barrenechea, playing Villa-Lobos and other Brazilian composers. The program is live on Radio MEC on Saturday, April 9, 2011, and should be available to stream online the same day. Here's the link. Jorge Luis Prats plays Bachianas Brasileiras #4 and Granados's Goyescas, in this 2008 video from the Concertgebouw. This is from the excellent AVRO Klassiek portal. 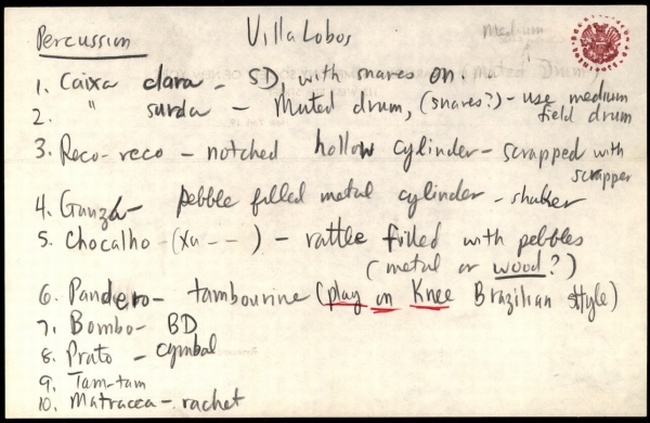 Another Soundcloud.com set: all 9 tracks from the great Projeto B album A Viagem de Villa-Lobos. There's more information on that project at The Villa-Lobos Magazine. Found on Soundcloud.com: a track from the new Brazilian Guitar Quartet CD from Delos. It's A Procura de uma Agulha, originally one of the Cirandas for piano, arranged for four guitars by Tadeu do Amaral. Keith's Classical Corner at WGBH features Villa-Lobos Guitar Preludes and Etudes. NPR Music podcast: 11.16.2010, KUSP's "The Aeolian Impromptu", 150 minutes of 20th century music, including Bachianas Brasileiras #4 (not #6, as shown in the playlist), from the classic Louisville recording. The program Música e Músicos do Brasil, on Radio MEC on Saturday evenings, features great Brazilian orchestras and soloists. You can listen to Podcasts of these programs on the Radio MEC website. On the November 6 program, cellist Antônio Meneses and pianist Ricardo Castro play Villa-Lobos's Pequena Suite. On the October 23 program, pianist Paulo da Matta plays Villa-Lobos and Chopin. Program information is here. This is a site to keep an eye on. From Deutsche Welle's excellent podcast archive of live concerts, the Sinfonica Heliopolis under conductor Peter Guelke play Bachianas Brasileiras #4. See this article about this amazing youth orchestra, currently touring in Europe.